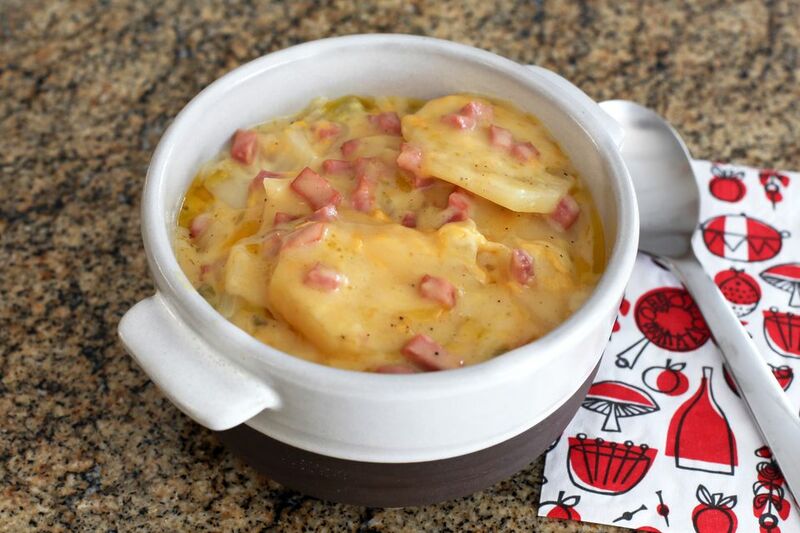 These scalloped potatoes are cooked in the slow cooker, which makes them especially convenient when the oven is needed for other things. This is a good choice for an everyday meal or for a holiday dinner. Butter the sides and bottom of the slow cooker crockery insert. Add the potatoes to the slow cooker along with the chopped onions cheese, and ham. Sprinkle with kosher salt and freshly ground black pepper and toss to distribute. In a small bowl, combine the condensed soup with the water; pour the soup mixture over potato mixture in slow cooker. Cover, and cook on HIGH for 4 hours, or until potatoes are tender. Gently stir just before serving. This is a good dish to take to a potluck supper or game. Just carry it in the crock pot, and plug it in when you get there. Pack the slow cooker in a large container with blankets around it to keep it from cooling down. Then set it on high to get it back to temperature when you get to the event. The important thing to remember is that bacteria can grow at temperatures between 40 F and 140 F. Generally, food should not be kept off of the heat for more than 2 hours after cooking. Or, in the case of cold foods, food should not be kept out of the refrigerator for more than 2 hours — if the temperature is over 90 F, no more than 1 hour. Instead of water, try evaporated milk with the condensed soup. Omit the ham or use a vegetarian equivalent for a meat-free dish. Vegetarian bacon or "sausage" crumbles would be good in the dish. Rub the cut sides of a halved clove of garlic over the sides and bottom of the crockery insert of the slow cooker. Add diced red or green bell pepper along with the onion. Add chopped or sliced celery along with the onion. Use a cheddar jack blend of cheeses, smoked cheddar, or colby cheese, or use part Velveeta cheese. Replace the ham with browned and drained sausage or about 1/2 pound of diced cooked bacon. Use seasoned salt or Cajun or Creole seasoning instead of salt.